These posts are about branches in Andrew’s Nelson branch. Surnames include: Nelson, Heaton, Wood, Bastion, Galloway, Potts, Boys, Boring, Corey, Parsons, Sparks, Hornaday, Ward, and Caywood. So, I like to be a little different. Some people like to have babies who are full-sized after a 9-10 mos pregnancy. Nope. Not me. I am into delivering before even the third trimester. Actually, I didn’t choose to deliver that early. I was very sick; and my little stinker, Coraline Reed Nelson was born on 11/20/2012 at just 1 lb 1 oz. 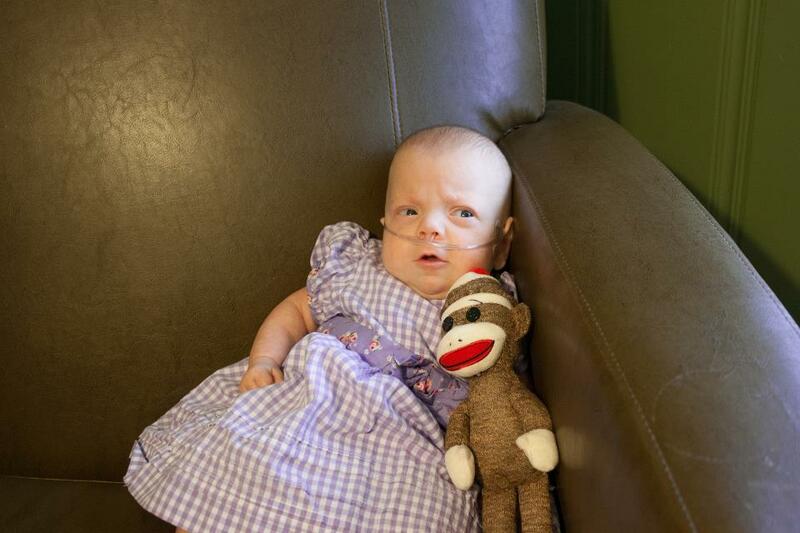 She just came home from the hospital and her NICU life three weeks ago. She’s a pretty awesome baby. She sleeps through the night (sometimes with one snack break in the middle – depending) and is really cute. Coraline poses with her sock monkey friend. We hadn’t even discussed names. Andrew still said we had plenty of time. The goal was to each make a list of 10 names that we really liked and then we would cross reference. My list consisted of a lot of family names for either the first or middle name. My family doesn’t really have a ton of awesome names, but one of them was Cora. My great grandmother was Cora (Motzenbacher) Smith. I never met her as she died a few years before I was born, but her daughter, Lois (Smith) Kinsley was a fabulous lady. So I can only imagine that Cora had to be as well. Coraline seemed like a nice play on the name so I put it on my list. Reed is Andrew’s mom’s maiden name. I think it’s pretty. And Nelson is…well…Andrew’s last name, obvs. I was on a magnesium drip when we chose the name. If you’ve ever been on it, then you’ll understand that I am very lucky that my child isn’t named “Puppy McGee Nelson” or something. I was TOTALLY out of it. I hope to never have to be on magnesium again. No fun. No fun at all. So I’m not really sure how the decision making process went with Andrew. I don’t really remember. Everything is very fuzzy. Unfortunately, just as Coraline was coming home, another part of the Nelson family tree died. 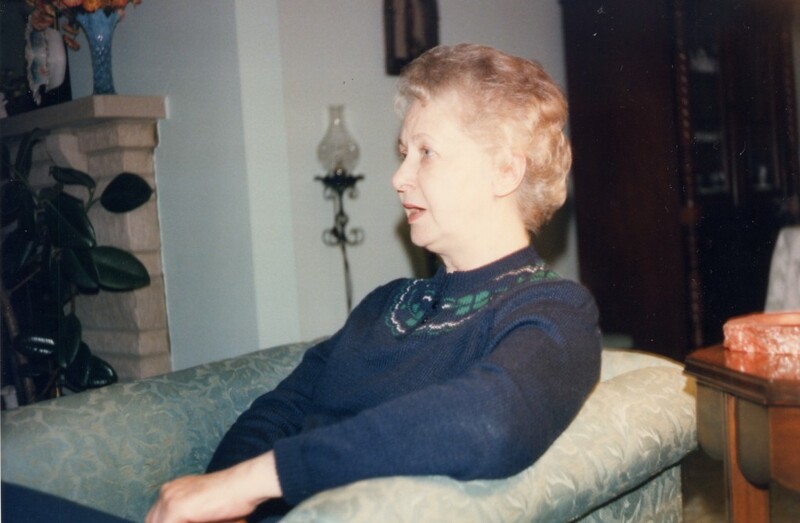 Dorothy Jane Boyce Nelson died at age 96. She was a great lady and had an amazing life. I can only hope to have such a full life. 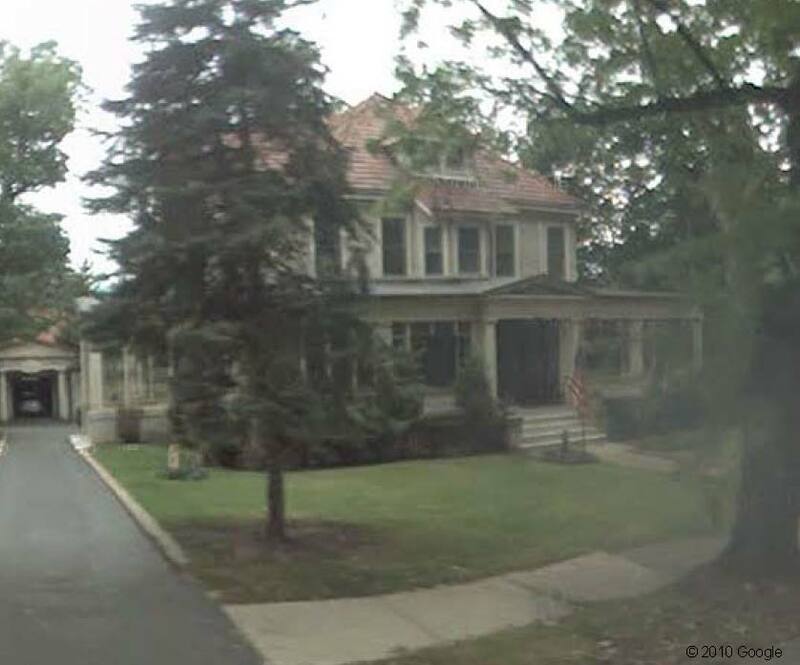 Since her death I have been reminded of the really interesting Indianapolis roots in that family, and will hopefully continue to find new information and will continue to post. Babies keep you busy, though. For serious. For updates on little Coraline, visit the other blog at www.AndrewAndErin.com. Still Amazed at Andrew’s Native Indy-ness. So I went to the library on Thursday for a short little stint after school and was possibly going to meet up with my friend Amy. She was, however, waylaid by the Catholic cemeteries and couldn’t make it. No fear, I had plenty of my own research to do. 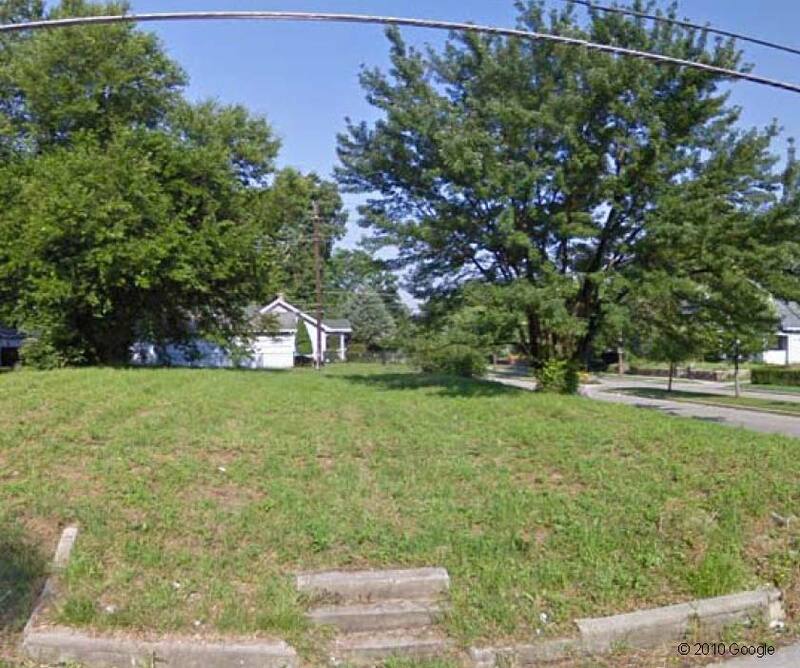 One thing I was really hoping to accomplish was discovering the location where Andrew’s Heaton branch had property throughout Marion County, and how early did they get here. Well, using the deed records I was able to find out a couple of locations. 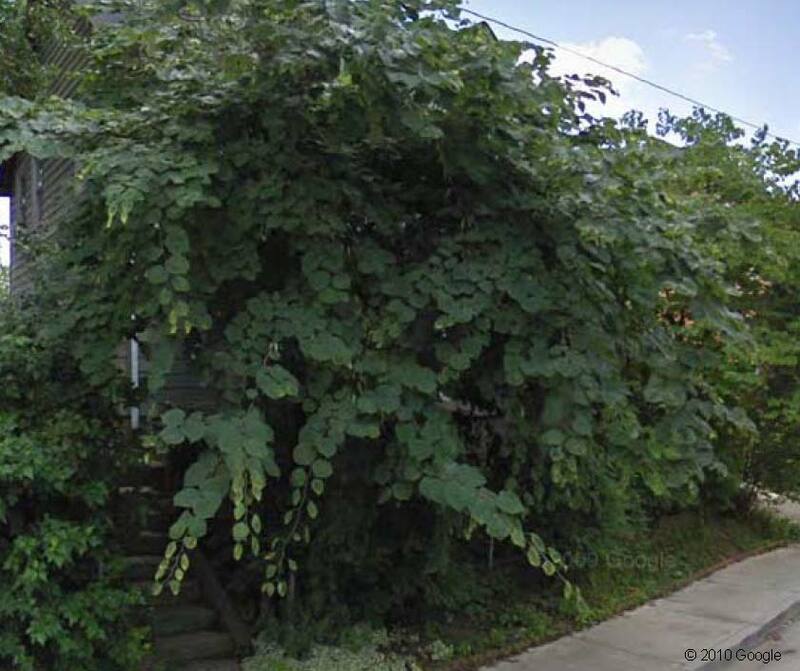 Andrew’s gggg grandfather, Eli Heaton, had about 80 acres up in the Nora area (which is now a shopping center that runs right along the Monon Trail) that he bought for $300 in 1835. I’m currently trying to somehow prove that we are entitled to that land now, and all the subsequent improvements to that land. 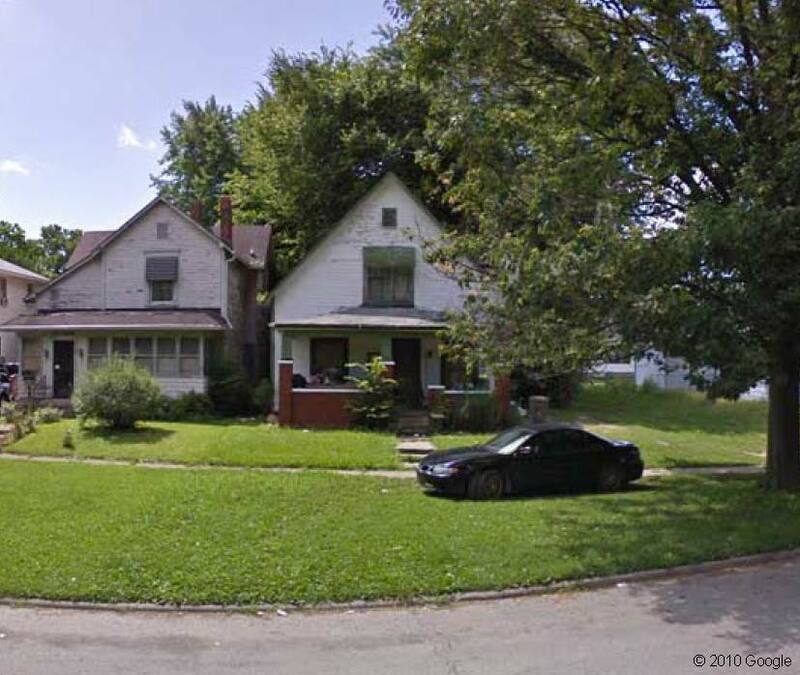 I also discovered that Andrew’s gggg-uncle purchased land on the south side of town, not far from where we live now. 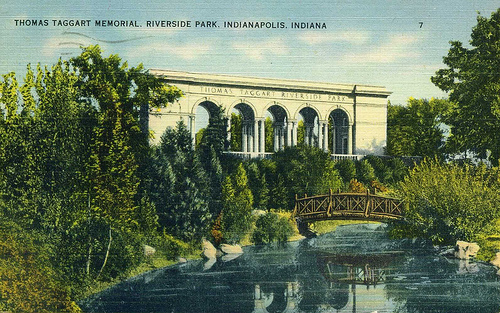 Asa Heaton owned a chunk of land that now lies adjacent to the Eli Lilly Recreation Area off Raymond Street in Indianapolis. He paid $100 for this in 1823. I’m not quite as excited about this chunk of land as it is now being used for industrial uses. Sneh. I also decided it was finally time to stop by the old family cemetery (since we were driving by it anyway) and see where the Indy old-timers are resting. It’s a lovely little cemetery really, just 1 mile north from where Andrew’s parents reside today. 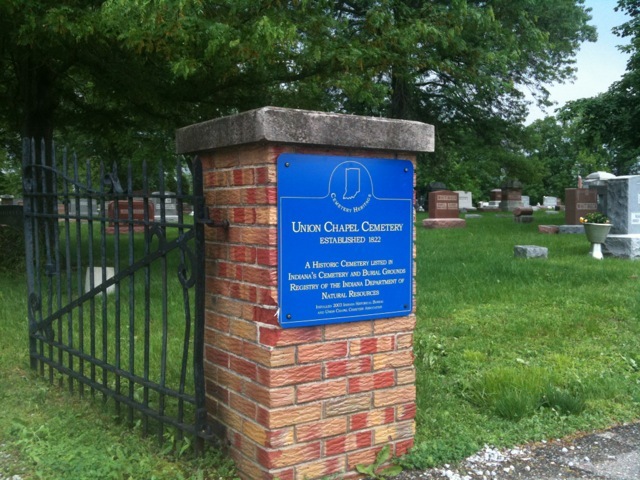 Entrance to Union Chapel Cemetery on the far north side of Indianapolis. But isn’t it insane? They’ve been here since at least 1823! Indiana wasn’t even a state till 1816. Good job, Heatons. Now, why aren’t there any streets named after you? I have one other friend who is really into genealogy. We’ll call her J-Wow. Her love for geriatric hobbies goes well beyond my own. She also loves to knit! She even owns a spinning wheel! (what??) Luckily this friend is in town, and sometimes it’s nice to have someone with me to go hunting for gravestones, or scavenge through the state library. She is usually up for such adventures. In fact, she has recently gotten very interested in old pictures. Not just her own, you see. But everyone’s. I think this is fabulous. J-Wow was talking the other day about this new focus of hers, and how she was really getting into her own family photos. I, on the other hand, was lamenting my total lack of any family photos. I mean, don’t get me wrong, my mom kept scrapbooks like a champion, but if you’d look at the shelves of pictures you would think that nothing had happened before she was born. I would LOVE to discover some rare tin-type of my great-great uncle in his army blues. So yeah, I’m a little jealous. J-Wow’s plan is really great though. She is going to collect photos that are rare and in decent conditions, saving them from the trash cans they will surely find soon, and post them on the internet for family members to find. This will be a much easier process with any names on the back, or information in general. I think she is doing an interesting and helpful thing for those of us out there who have NO idea what our family members looked like. So here’s my next and final thought. I love old timey pictures, but sometimes old timey people creep me out. 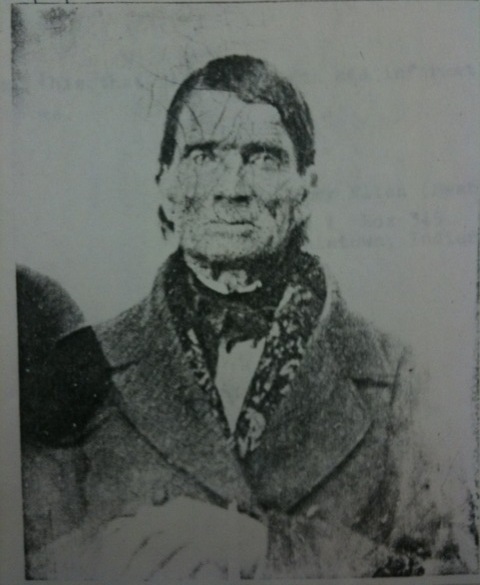 This photo of Daniel Heaton (d.1863), is located in the family history at the Indiana State Library. Case in point: Andrew’s great great great great uncle Daniel Heaton. Creepy, right? Eek. I just started a new job. While I am excited to have a regularly paying gig, it really does cut into my exciting new life of genealogy-traveling. What DOES excite me, is that I have a teacher’s schedule and I have a decent amount of time off which allows me to get around. What made Riley such a mystery was that he died very young, leaving his poor wife Fannie a widow with three kids in her mid 20s. Riley was just over 30. I wanted to try and figure out what happened, where he was buried, and who his parents were. I came home with some answers, but more questions. I drove to Crawfordsville, a little town that is home to Wabash College. I find that little college towns are kind of the best. They have that small town charm but have a few really tasty places to eat. I sought out the food before I headed to the library. I almost drove off the road when I turned a corner and saw a sign for Arni’s! YES! ARNI’S! Arni's gleaming sign in the afternoon light. 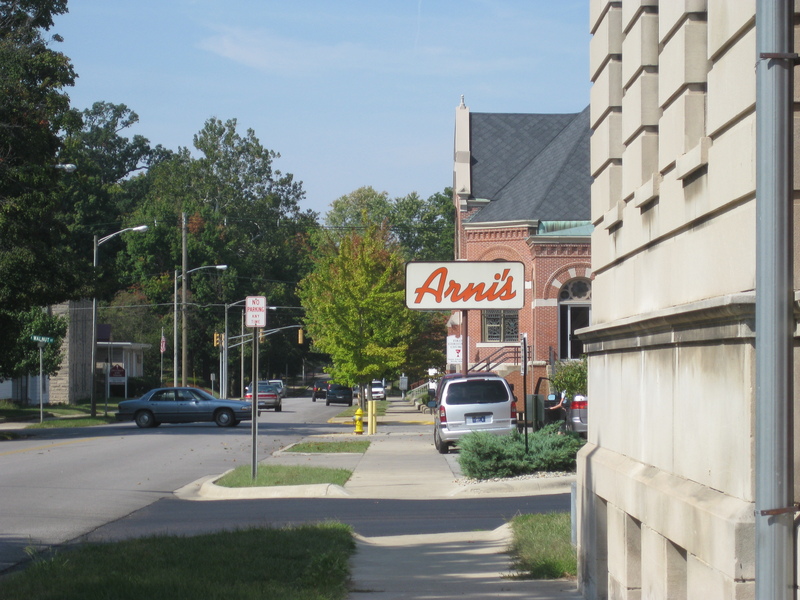 When I was growing up there was an Arni’s very near my house. My sister, Kristen, worked there for years. There were bikes all over the walls. Celebrity cardboard cut-outs filled the foyer and bar. The place was a heaven of tacky. I loved it. I still love it in my memories. That Arni’s is now gone and they have moved even farther north and made it “nice”. They have also changed the menu a bit which upsets me even more. I went to this Arni’s once and that was the last time. It was too depressing and nice. This Arni’s looked just dingy enough for me to enjoy. I walked in. While there were no bikes or tacky decor, it was only counter service, the place was small and laid out weird, and it smelled like Arni’s. Perfect. I had a luscious hot ham and cheese and made my way over to the library, which was right next door. I am one of those people who feels weird talking to people I don’t know. When I actually do it, it’s not painful, but I just have to work up courage first. Here are some things I hate: calling to make reservations over the phone, asking for directions, getting my haircut because of the requirement for small-talk, and asking librarians for help when I’m not really sure what I’m looking for. I am sure that librarians LOVE the challenge. I would! But not everyone is like me. This makes me feel awkward and guilty simultaneously. So I went to the family research section, which was fairly large. I LITERALLY looked at every single book on the shelf and leafed through many more of them trying to find some information. The only thing I could find about this Riley character was his death date, which I already knew. So after about 2 hours of just browsing and hoping I went to talk to the librarian. Why didn’t I do this in the first place?! Within two minutes she used the death date to pull up a file on the computer which had a copy of his death certificate. This included how he died (unreadable), how long he’d been sick, what his parents names were, and where he died. Poor Riley had been sick for 2 years before he finally died. His parents were listed as Phoebe and Anthony Bastion. 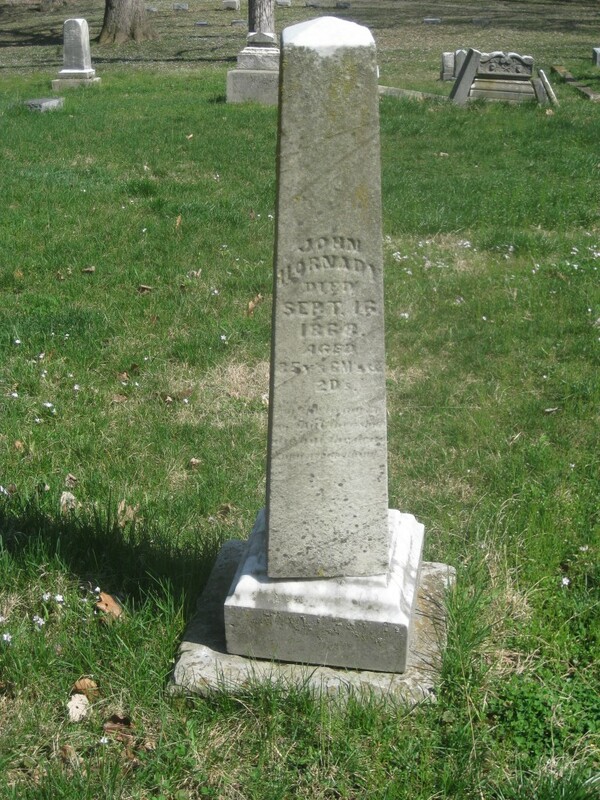 He died in Crawfordsville, which I had already suspected, but there was still no word on where he was buried. I was so excited to get this information that I immediately went home to enter it into my computer to see what I could find in addition based on my new info. And what I found was so frustrating. Anthony and Phoebe may NOT have been his biological parents. They may have adopted him and changed his name somewhere around his tenth birthday. He may have been named William Riley Wheeler prior to that, but I can’t be sure. This guy is going to require more than one trip to Crawfordsville. At least I know there is an Arni’s there to keep me happy and full before I start a long day of mystery-solving. This has been a rough week. I have been sick. I actually did start to get better, and then went ahead and got sick again a few days later. During one of my healthier days this week I decided to take a little trip to Rush County to see if I could find some of Andrew’s family who are buried there. I also thought I might spend some time at the library there. I got in the car and started going through a book of CDs that Andrew found in the basement. I don’t know how long they had been down there, but I was so excited to come across one of my favorite Eels CDs, Shootenanny!! GREAT Album. It was Saturday morning, which made the song (Saturday Morning) that much more enjoyable for me. Just as a side note. Only the Eels could make a song as creepy as Restraining Order Blues sound so pretty. If you haven’t heard the album, I’d highly recommend it. My first stop would be McCarter Cemetery. This cemetery is literally in the middle of nowhere. I spent about 20-30 minutes there and didn’t see a car the entire time. I did, however, see an Amish horse and buggy. The closest town is Milroy. Not much going on there, either. But honestly, this was a beautiful cemetery. 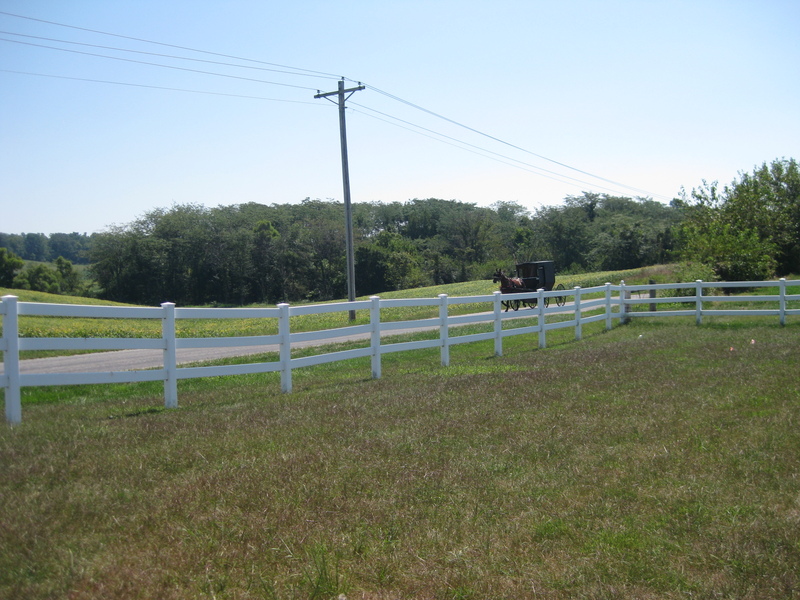 It was so quiet with a beautiful view of barely-rolling hills, with little one lane roads cutting through the land. I could have sat here all day. Luckily, this was a really small cemetery and I found Andrew’s family pretty quick. His Corey family is buried here, along with some of his Boring family. In fact, his gggg grandmother lived to be at least 100 years old. 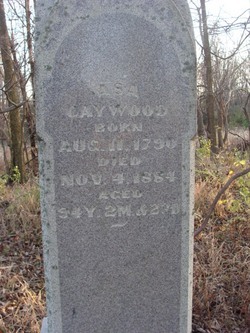 The gravestone said 1776-1886 100 years. So someone was bad at math, but he’s got some healthy genes either way. Supposedly this Corey family is of relation to Giles Corey/Cory. He is the man who was pressed to death by heavy stones during the Salem witch trials. I have yet to get that far back in the history, but if I have to make a trip out to Salem, so be it. I LOVE Salem. I found a nice little spot under a tree where I could sit for a bit and relax. I just sat and listened to the wind blow through the dying corn plants behind me. It hasn’t rained here in about 3 weeks, working on 4. Everything is brown. I believe that the tree I found was also the spot for some sneaky corn-stealing squirrels to munch down on their stolen goods. 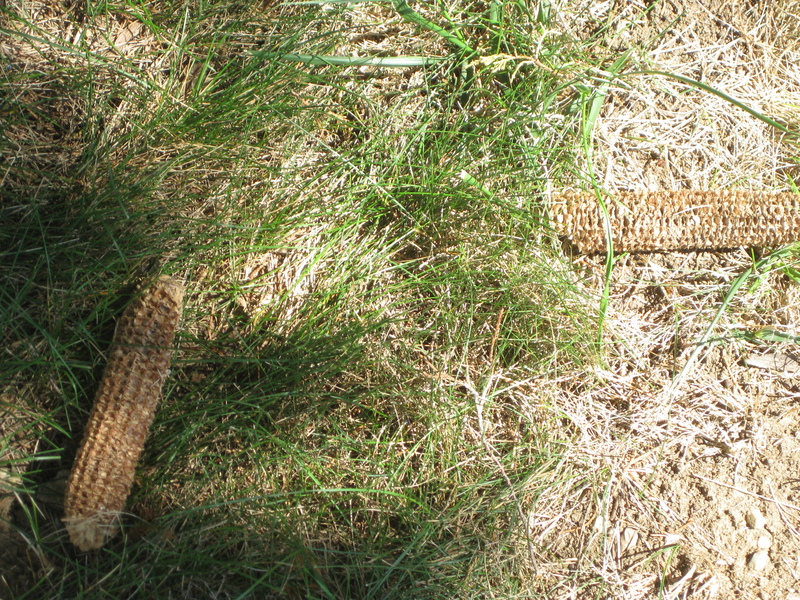 Discarded corn cobs. Those crazy squirrels! 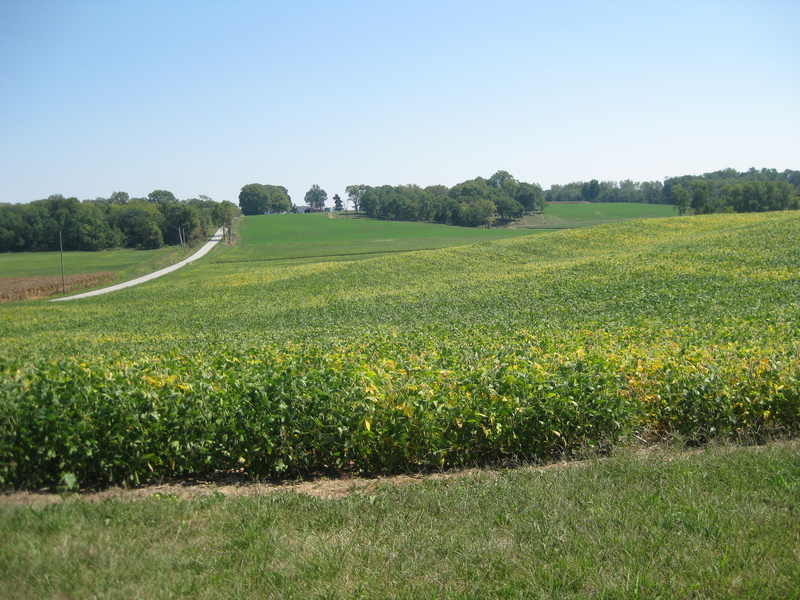 I left my peaceful little world of McCarter Cemetery and headed for the big city, Rushville, Indiana! Andrew also had family buried here. His grandmother’s maiden name is Boyce, which I have since learned was Boys about 2 generations before her. 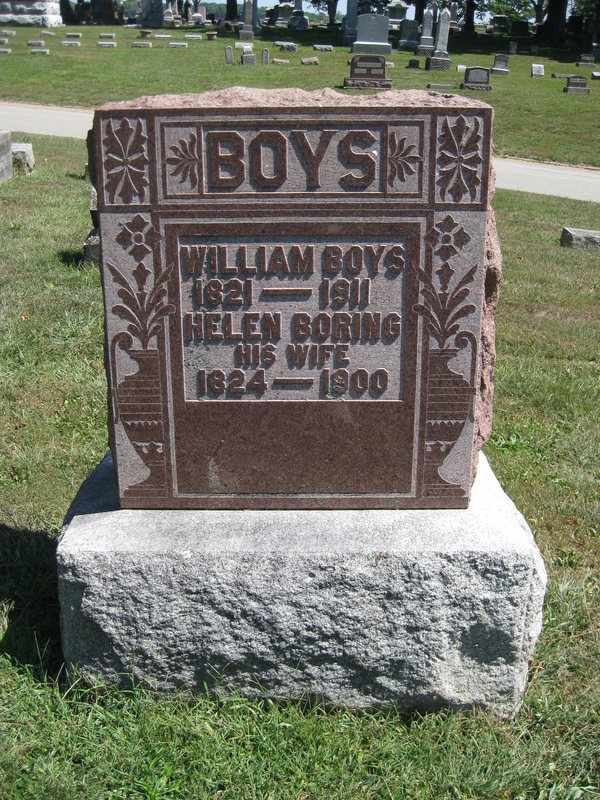 I knew that this Boys family was buried in East Hill Cemetery in Section 3, thanks to findagrave.com. However, this was a MASSIVE cemetery. I drove in and was like, “whaaa?” I found section 3 fairly easily, but even this section alone was massive! Miraculously, I managed to find the Boys family in less than 3 minutes! They were right by the road. I got out to take a picture. Now, sometimes I have an occasion where I think to myself, “If someone was paying attention to what I’m doing right now they would think I was insane.” I mean this about life in general, not necessarily grave hunting. There have just been these moments in my life that are like that. Sometimes when I see someone who I think is acting very strange, I just have to remind myself that I have also had these moments, and there’s probably a very logical explanation. While I was hunting for the grave I noticed a man and woman in the same section. The woman seemed normal, but the man seemed frantic. They had a glass that they kept filling in some water pump and taking it back and forth to a headstone, from what I could tell. He was dressed nicely, as if he had just left church (It was Saturday) and his lady friend was in like a black cocktail dress. When I finally got close enough to hear what they were saying. The man was raving about how great the stone was. And how when he died he was very interested in this certain type of stone. He was wild-eyed. He moved at twice the pace of the woman he was with could move. I didn’t make eye contact. I was kind of scared of him. But maybe I was just hungry. I was getting hungry to the point of light-headedness and decided I should find somewhere to eat. This is one of my favorite things to do on these little excursions. I love finding new small-town eateries. So I pulled out the trusty iphone and searched for restaurants in the area. I could only find four. One was Hardee’s. I don’t think so. One was Mexican. Not in the mood. One was Pizza King. I can’t eat a whole pizza alone. And the other was a little Corner Cafe. That sounded perfect. I parked, and walked to the door. CLOSED?! What? It was barely after 2! I thought I would drive around and see if I could find something that might have not shown up on my phone. I passed the library and thought I would check the hours. I was pretty sure they were open till 5. I popped by the sign and, what?! They closed at 3! Rushville, you’re killin’ me! This is the part where I gave up. I decided to hop on SR 52 and head back to Indy. There would be a restaurant somewhere along the way. I was right. I found a Dairy Queen type place where I could get some chicken fingers and ice cream. I hopped back in my car and headed home along 52 which is a lovely drive. A country road interrupted by cute little towns every few minutes. The Eels accompanied me to Rush County and Coldplay brought me home. It was a lovely drive on a lovely day. The Girl Scouts stole my cemetery! I had a few hours to burn and had recently been trying to find some information on Andrew’s Indianapolis pioneer relatives. There are a few cemeteries around town where I haven’t been able to find the best records and I think there MIGHT be a chance they’re buried there. 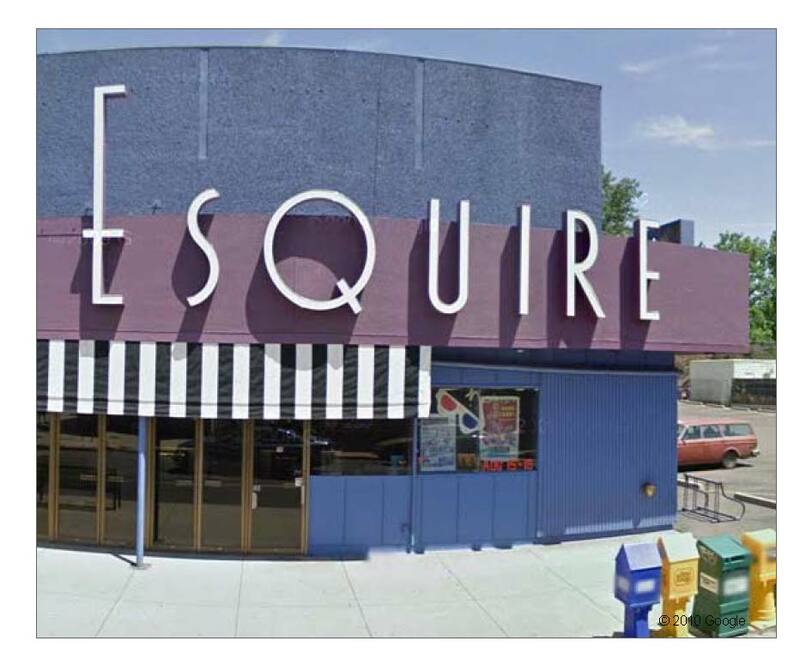 His branch of the Sparks Family were folks who lived up on the Northwest side of Indianapolis in and around Pike Township. 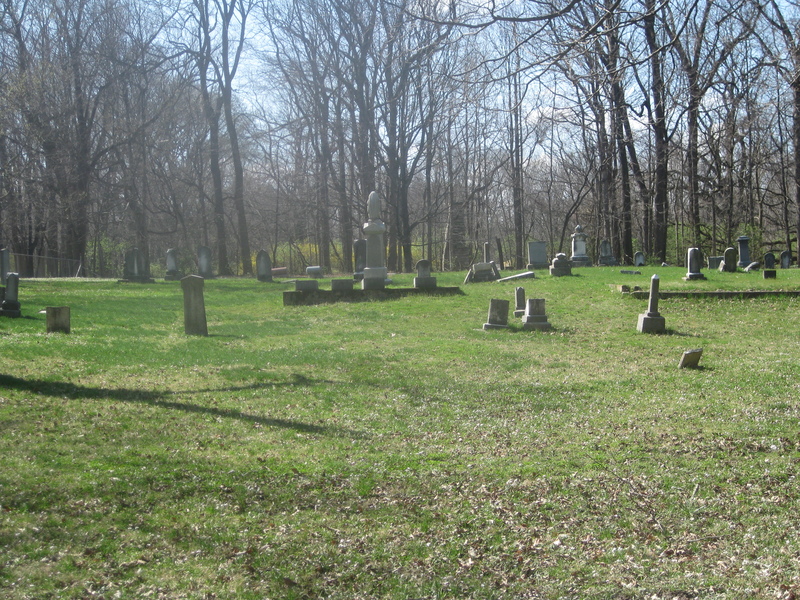 Just south of Pike Township is the Old Union Cemetery. I actually think it might technically be in Speedway. 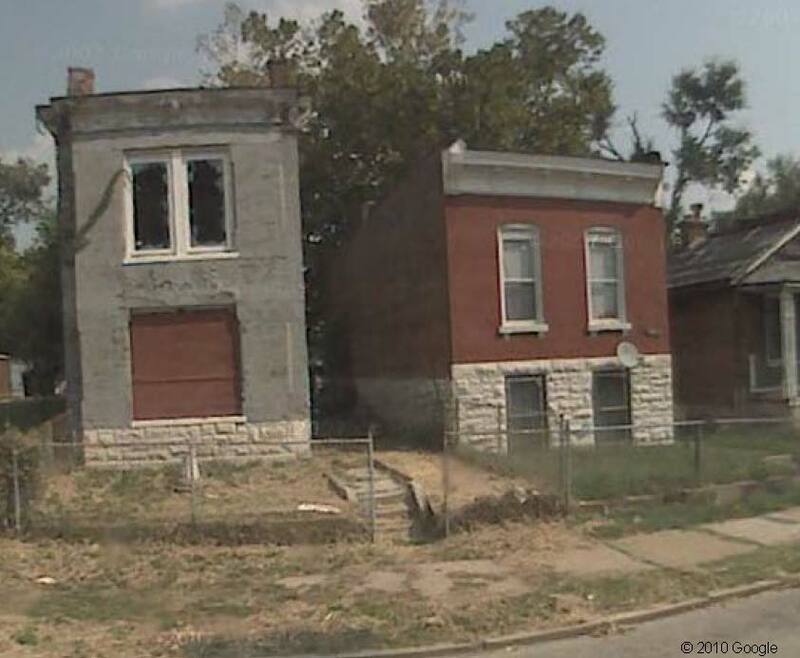 Anyway, I thought I would go check it out either way, Pike Township or not. I like cemeteries. So I checked it out on google maps and plotted my course. I followed the directions. I ended up in a cul-de-sac. There was no cemetery here. There were, however, suspicious residents. I guess people don’t get lost there often. 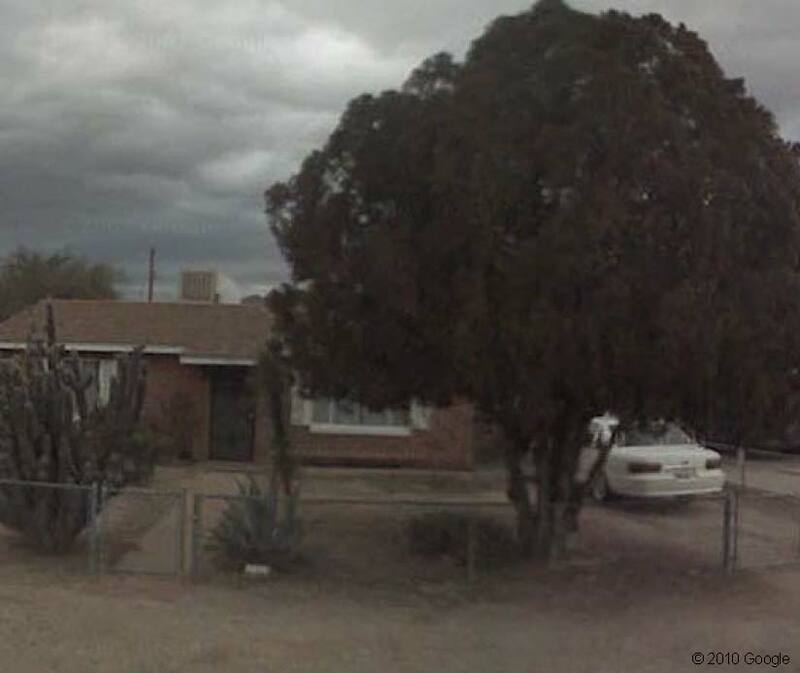 I pulled up the map again on my phone and found another road that looked adjacent to this supposed cemetery. As I turned into the only road on that street I realized where my cemetery was. I was at Camp Dellwood, a Girl Scout Camp! The camp ate my cemetery. I wasn’t really sure what to do. I thought about looking for someone to help me but I didn’t want to seem creepy (which could easily happen at a children’s campground) so I decided to try and call them to make an appointment or something. I made sure to glare at everyone that I saw as to accurately reflect my disapproval. I’m not sure they cared. I’m pretty sure they didn’t. **As a side note, there will be a lot more postings initially on this blog because I have to catch up on what has already happened.